Our product range includes a wide range of chennakesava temple somanathapura holiday package, gomateshwara statue holiday package, durga temple aihole holiday package, badami holiday package, bangalore palace holiday package and belur and halebid holiday package. 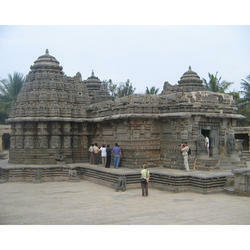 The Temple of Somnathpur Chennakesava stands on the edge of the peaceful village of Somnathpur 35 km from Mysore. The temple is built in the shape of a star. The triple towers and walls are covered with beautiful sculptures. It is a perfect example of Hoysala architecture at its best. The frieze depicts elephants, horses, flowers, lions, birds and beautiful sculptures of gods and goddesses in epic Hindu scenes. 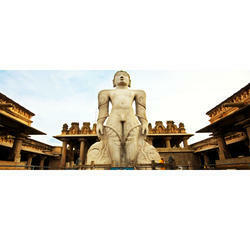 Sravanabelgola is known for its colossal statue of Jain Saint Gomateshwara. 614 steps lead to this monolithic statue 18 meters high built atop the hill Indragiri. It is considered to be the world's largest monolithic stone statue. Every 12 years Jains from all over India gather here for the spectacular bathing ceremony of the statue. Located on the banks of the Malaprabha River, the village of Aihole in Karnataka is a real mix of old Hindu temple architecture with hundreds of temples around the village and fields nearby. 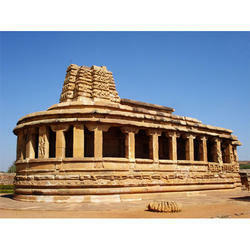 During the reign of the Chalukyas, Aihole was the first capital of the Chalukyan Empire. The name 'Aihole' originates from the legend associated with the cult figure of Parashurama in Hindu mythology. The first group of temples dates to the 6th and 7th centuries, and the second groupe to the 12th and 13th centuries. Built between two rocky hills, the town of Badami was the capital of the Chalukya rulers between 540 and 757. 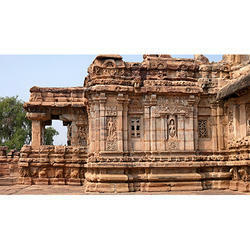 The Temples built at Badami during this period were inspired y the Dravidian style. The city is known for its temples carved into the rock. It has four temples and a natural cave. Two of the temples are dedicated to Vishnu, the third to Shiva and the last one is a Jain temple.In the first temple of Vishnu, there is a statue of Vamana and Varaha, two incarnations of Vishnu.In the Shiva temple there is a representation of a Nataraja (dancing Shiva) with 18 arms and 81 poses.These caves overlook the large bathing pool of Agastyatirtha dug in the fifth century and on the banks of which are the two temples of Bhutanatha. Bangalore is the capital of Karnataka. The city was founded in the sixteenth century and was soon fortified by Hyder Ali and Tipu Sultan.The modern city has experienced a significant economic boom with the introduction in the 60s of high-tech companies. It is now a major center of scientific research in India especially in the field of Information Technology.The fort was built by Kempe Gowda and expanded in the sixteenth century by Hyder Ali and his son Tipu Sultan in the eighteenth century.The palace was built in 1887. The architects were inspired by the English Tudor style castles. There are numerous paintings and sculptures in the palace.Located south of the city, the Botanical Garden of Lalabagh, with an area of â€‹â€‹96 hectares was designed by Hyder Ali. Dozens of species of trees were planted by Tipu Sultan. Today there are over 1000 species of tropical flowers and trees. The main attraction of the garden remains the gigantic greenhouse modeled on London's Crystal Palace.The 'Nandi' Temple,built in the Dravidian style by Kempe Gowda, houses a huge monolithic statue of the bull Nandi ( 4.5 m high and 6 m long). 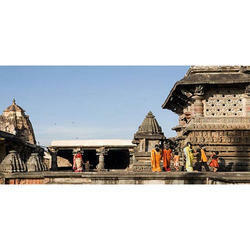 Belur and Halebid were the two major cities of the Hoysala rulers. Halebid was the capital of the kingdom in 1060. This dynasty reigned between the eleventh and fourteenth century.17 km apart, the two cities have preserved the great temples built during this period. They are witnesses to the exuberant artistic wealth of the period. The Hoysala rulers converted to Jainism, which explains the presence of Jain deities alongside Hindu deities. The Temple of Chennakesava (Belur)Originally called the Vijayanarayana Temple, its construction was initiated in 1116 to celebrate the victory of Hoysala over the Cholas The temple construction was completed 103 years later. The facade of the temple is covered with the carvings of animals, deities of Hindu sages, friezes depicting scenes of sacred texts. None is identical to another. Unlike other Hoysala temples, the interior is as richly decorated as the exterior, including the lintels and pillars. The temple has a gopuram (monumental tower) built in the fourteenth century and a bathing pool. The Temple of Hoysaleswara (Halebid) Construction began at the same time as the Chennakesava Temple but it was never completed despite 80 years of labor. Yet it is the most outstanding example of Hoysala art. The exterior and interior walls are entirely covered with sculptures and friezes of all kinds. They depict scenes of sacred texts but also the way of during the Hoysala period. Hampi is an Indian village located within the boundaries of the ruined city of Vijayanagara,the former capital of Vijayanagara kingdom,north of the state of Karnataka,in the valley of the Tungabhadra. Vijayanagara was once the capital of one of the largest Hindu empires. This empire was founded by the Telugu princes in 1336 and peaked in the sixteenth century. At that time,the city was described by foreign travelers as fabulously wealthy (the empire controlled the regional trade of cotton and spices) and probably had up to half a million people-a population that was substantial at the time. The city was surrounded by seven fortified walls and covered an area of 43 km2. After the defeat in 1565 of the empire against the coalition of Muslim sultanates of the Deccan during the Battle of Talikota,the empire collapsed abruptly and the city was plundered and abandoned,leaving a series of remarkable buildings in an unusual and grandionse landscape. Pattadakal, in the state of Karnataka, represents the high point of an eclectic art which, in the seventh and eighth centuries, under the auspices of the Chalukya dynasty, achieved a harmonious blend of architectural forms from northern and southern India. There are an impressive series of nine Hindu temples, as well as a Jain temple. In this group stands a pure masterpiece, the Virupaksha temple, built in 740 AD by Queen Lokamahadevi to commemorate the victory of her husband over the kings from the South. 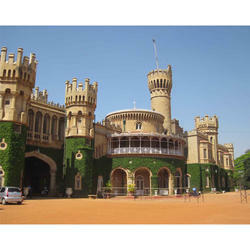 Mysore is the third-largest city in the state of Karnataka. It served as the capital city of the Mysore Princely Kingdom for nearly six centuries.The Mysore Palace, built in the Indo- Saracen style with domes, turrets, arches and colonnades, is a treasure trove of exquisite carvings and art work from around the world. The carved doors open onto luxuriously furnished rooms. The majestic Durbar Hall has an ornate ceiling and many sculpted pillars. The Marriage Pavilion is adorned with varnished tiled floors, stained glass ceilings and domes. The enclosure of the palace houses the Residential Museum, temples and tombs, including the Shwetha Varahswamy Temple.The Chamundi Hill at a height of 1060 meters overlook the city. 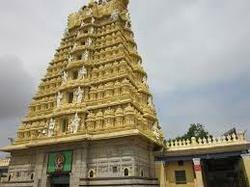 It houses the 12th century Sri Chamundeswari Temple. Sri Chamundeswari was the patron goddess of the Wodeyar dynasty. The seven-storey gopuram (tower) of the temple is 40 meters high and is covered with statues of the goddess in all attitudes. At the front of the temple is a huge painted statue of Mahishasura, a demon who was defeated by Chamundeswari. Adjacent is a monumental statue of the bull Nandi dating to the late 17th century and carved from a monolith 5 meters high.